 Dubbelvagn T2000 typ AAE "Crossrail"
Dubbelvagn T2000 typ AAE "Crossrail"
By buying this product you can collect up to 824 bonuspoints. Dubbelvagn T2000 typ AAE 'Crossrail', längd över buffertar 390 mm, epok VI. 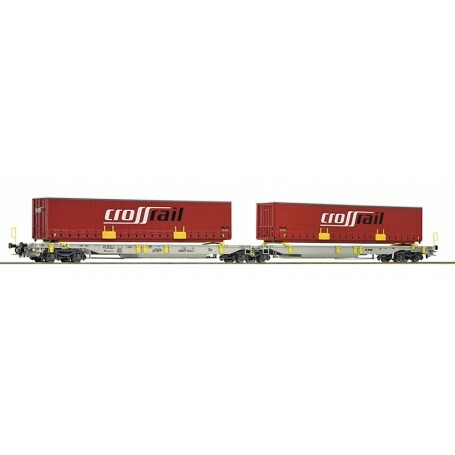 Articulated double pocket wagon type T2000 of the AAE. Epoch VI. The wagon unit carries two slide tarpaulin semitrailers from the company Crossrail. Rich detailing on the model that has a coupler pocket according to NEM 362 standards and close coupling mechanism.